The Islamists are angry from Bassem Youssef as usual. Already they used to hate him during Morsi so there is nothing new about it. The new thing is the reaction of the Pro-military rule/Pro-El Sisi supporters who used to cheer for Bassem . The Pro-Military supporters are extremely angry because the famous satirist dared and spoke about the general !! He did not even mock him directly. 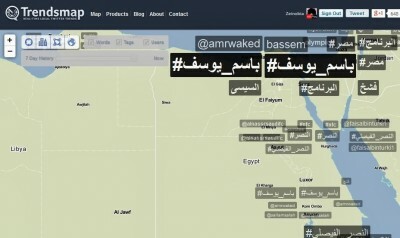 Bassem Youssef and his show were trending on twitter. On Friday [February 7, 2014], the show was back on MBC Masr, a channel owned by Saudi businessman Waleed Al Ibrahim. And, as usual, people were wondering whether Youssef would dare mention Egyptian strongman and Defense Minister Field Marshall Abdel Fattah El Sisi, even before the episode was aired. @A_AHaleem: For sure Bassem Youssef will not mention El Sisi, and will dance on the dead bodies of the Ikhwan more and more. After a feverish search for free network, Egyptian satirist, Bassem Youssef, has decided that Saudi MBC TV station is the freest of them all. How cute. I am sure that the new boss of Youssef would let him mock the Saudi King and Sisi. avoid the one who won't be named showing a silhouetted photo of El Sisi but man he mentioned names several times. In the second segment Bassem continued speaking about the El Sisi-Mania in the Egyptian TV that extended to cooking shows and fashion shows. The question now is for how long will the show continue on MBC Masr, before we hear the news of Bassem Youssef looking for a new channel for his show.